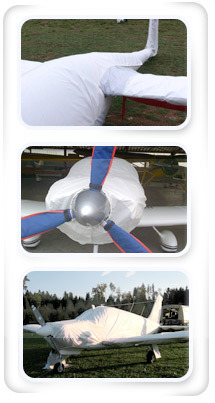 ISS-PROTECTall-weather covers protect sensitive surfaces against all external ascendancies, for example: rain, UV-radiation, dirt, dust and hail. The Covers are free from condensation and keep the surfaces dry. The covers are made out of several layers of fabric: Upper fabric for protection against external ascendancies as well as an inner lattice fabric for protection of the surface against scratching/static charge. ISS-PROTECTcovers are high quality products to protect airplanes, boats/ships and campers/caravans against all external ascendancies. The ISS-PROTECT ISS-Protect covers are made in Germany.